Doomed passion in Romantic-era Berlin would have most filmmakers reaching dutifully for the grand traditions of historical sweep, candle-lit interiors and an indulgence in every visual splendour of the time. In detailing the famed suicide pact between disaffected poet Heinrich von Kleist and timid hausfrau Henriette Vogel, Jessica Hausner’s film is instead a drily funny, strange and austerely composed chamber piece, and all the more intriguing for it. Early 19th century Berlin is gritting its teeth as a wave of Francophile ideals, fashions and philosophies disperse across Europe, an odious threat to the social elite. Firmly in the grip of a Germanic romanticism and with an unswervingly pessimistic worldview, von Kleist (Christian Friedel) hopes to recruit someone with whom to escape the meaninglessness of existence, and to love eternally in death. 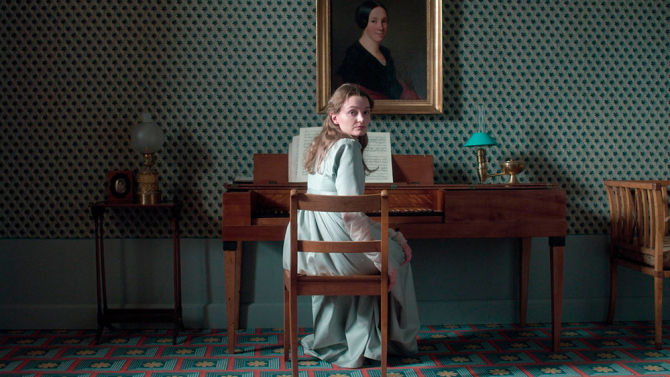 Taking as its cue his introduction to Henriette, an acquaintance’s wife, Amour Fou is a muted ‘romantic comedy’ detailing von Kleist’s continued attempts to draft a willing accomplice. As with her previous feature Lourdes, Hausner’s approach is wry, considered and unforgiving. Where she previously cast an arched eyebrow towards the big business of faith and those who suffer its supposed miracles, here she reveals the tortured romanticism of von Kleist as the most pompous variety of narcissism. Framing his monologues on life, love and death as increasingly petulant needling, and the constant rebuffing from his cousin Marie as a cruel way of settling for Henriette, von Kleist’s conceited plan holds scant promise for the woman lucky enough to be volunteered. It’s a funny slant, and occasionally plays like a dialled-down version of Woody Allen’s classic Love and Death. However, the truly beguiling elements of Amour Fou spring from the clarity of Hausner’s vision of the era. Or rather, they emanate slowly, hypnotically. A near-uncomfortable stillness marks proceedings, the camera a fixed eye on the haute bourgeois, slowly unpicking their rituals with the utmost patience. By refusing both the contemporaneity of handheld and the weightless sweep of Steadicam, a sealed, pinched, almost airless atmosphere is achieved. Henriette and her husband Vogel are enshrined in their home by stunningly oppressive wallpaper, and Hausner avoids acknowledging the presence of any windows for the longest time, instead focusing on the inward gaze of mirrors dotted around their house. As they and guests silently endure music recitals and engage in banal chatter in these environs, the film becomes a strange portal, the austerity of it all engendering an almost academic remove from the proceedings. The effect is undeniably deliberate, and approaches something like living history, or time spent in a preserved historical site sans the velvet ropes. It isn’t thrilling but feels entrancingly real, and is weirdly captivating as a result. Hausner’s is a dry kind of wit, quiet and unassuming. The cumulative effect of her satirical admonishment of a very male variety of conceited romanticism might seem as perceptible as a nudge. The detail in every aspect, however, elevates it far above the inconsequential. Beyond the chuckles – and there are a few – a small yet rich world is beautifully embalmed, silently and sharply observed by a director with an impressive, resolute and unapologetic focus.